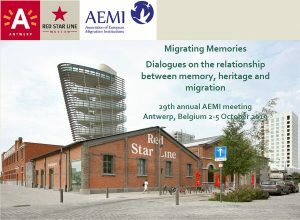 The 29th annual AEMI meeting is hosted by the Red Star Line Museum in Antwerp, which tells the story of millions of passengers who travelled from Antwerp, the Red Star Line’s main European port, to North America. Migration has been integral part of mankind’s history from ancient times, but individual and collective displacement have reached unparalleled proportions in the past decades. When migrants and refugees cross borders and try to settle in new environments, they do not only carry their important documents and belongings with them, but also traditions, memories and experiences of the places where they used to live. UNESCO defines heritage as “our legacy from the past, what we live with today, and what we pass on to future generations”. But memory and heritage change when people are on the move. Amongst heritage professionals and policymakers there is a growing awareness that culture and cultural heritage can be employed to meet the challenges of integrating migrants and refugees into society by means of participation. Through participative initiatives and encouraging active involvement from all social groups integration can be understood as a process of mutual understanding of each other’s past and present, culture and environment. More and more research and heritage institutions take up a role in safeguarding ‘migrating’ memories and cultural heritage. How do memories and heritage change through the (often perilous) journeys to a safe haven and better future? How do migrants and refugees cope with trauma and loss of family links? How does this impact on their new lives and on the places where they settle in? How does the new ‘home’ relate to the old one? What is their cultural contribution to the receiving societies? What about roots and family ties? How are memories and heritage passed on to the next generations? What about migrating heritage? These are only some of the issues this conference asks. The conference is designed to encourage provocative dialogue across the fullest range of disciplines and institutions. During the conference there will be a mix of presentations: papers, poster presentations, discussions and workshops. Abstracts of 300-400 words (including a short CV) in English should be sent as soon as possible but no later than Monday 1 April 2019 to: Bram.Beelaert@stad.Antwerpen.be . Conference participation is free of charge for AEMI members. Non-members are welcome to participate; only a small fee will be charged for coffee breaks and lunches. The language of the conference will be English.